You don’t realize you need it until you know it exists! Why would someone need a temporary email address you ask? Well, have you ever signed up for something that required that you provide an email address to receive a coupon or access code that you will never need again and avoid your email address from being sold or shared and ultimately prevent spam? This is the solution for you. Consider this option the most simplistic option. It’s really determined to be a simple 10min inbox. It will allow you to renew the time manually but once the timer is up the inbox is gone. I like how simple it is and is probably what you are looking for if you are even considering a temp email. What about security? 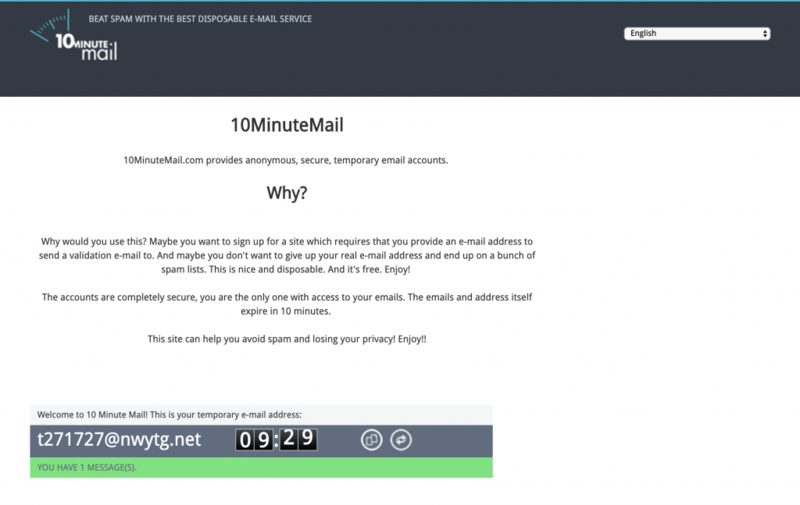 10MinuteMail uses some crazy cookie black magic to only give you access to the email box created so only you can see the messages. Two things to note, the email address is random and you can’t set the name or domain and the email address and messages will disappear after the 10 min. This one is very similar to 10MinuteMail except the box lasts 60min which could help in some situations. It also used some powerful e-voodo to make the messages secure but as long as you don’t clear your cache, you will be able to read the messages later. You will also be able to set the emails name do go with their random domains. This one is different in that it let’s you set some longer time frames for the mailbox and comes with a first.last@ style email address. It also associates with the browser and with the longer timeframes you will want to make sure you don’t clear that browser cache if you want to use that mail later. I hope you find a solution that works for you. I wish I had known about these years ago! Let me know if you have another or let us know why you use temp inboxes!